company to speak out against the law." – Elise Foley, Mar. 16, 2012. 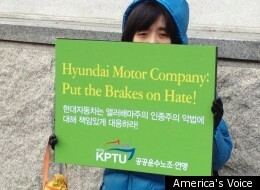 Protester stands outside Hyundai shareholder meeting in Seoul.